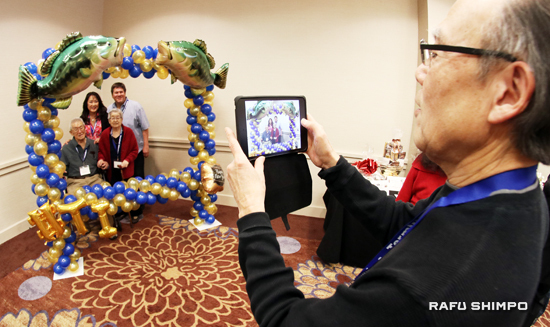 Celebrating the Year of the Rooster, the Terminal Islanders held their 46th annual New Year’s party at the Holiday Inn Airport in Long Beach on Jan. 8. 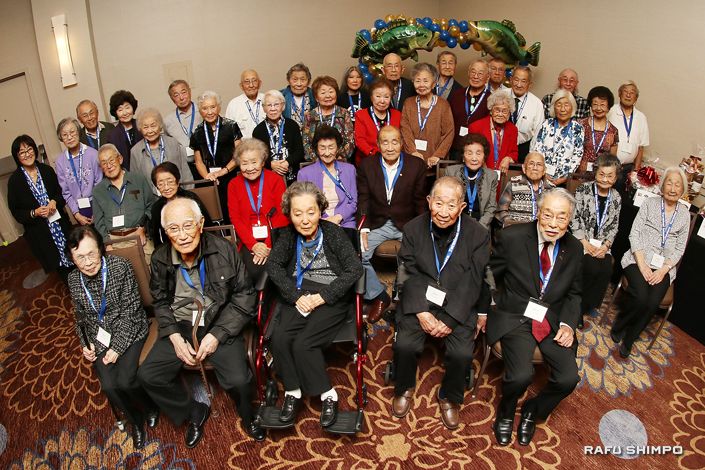 Above: Former residents of the prewar San Pedro Japanese fishing village pose for a group portrait. 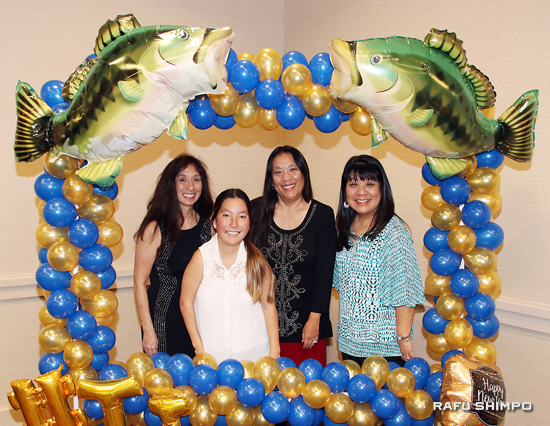 Above and below: The frame for souvenir photos had an appropriately fishy theme. 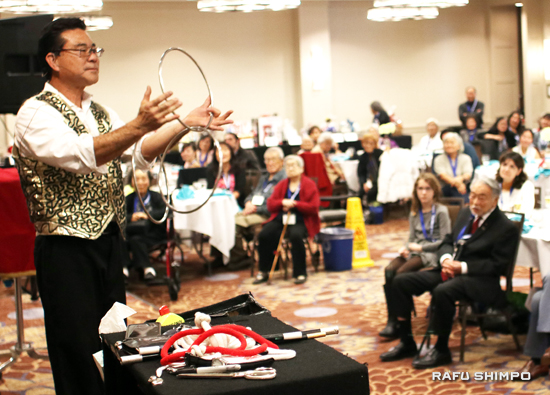 Magician Allen Roy Oshiro (pictured) and the Los Angeles Kayo Club provided live entertainment. 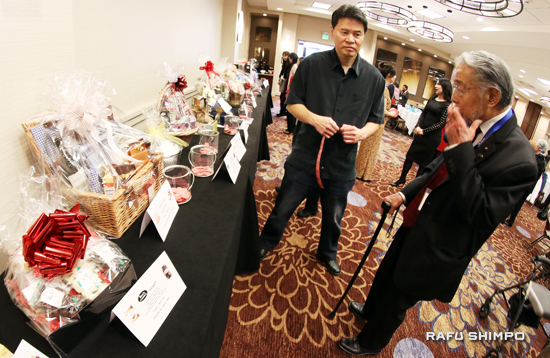 Minoru Tonai contemplates a bid during the silent auction. Volunteers kept the event running smoothly. 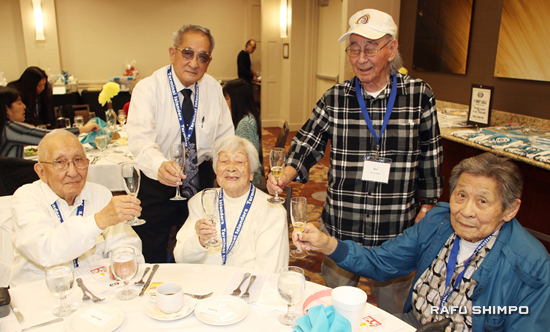 Families and friends drank a toast to the new year. 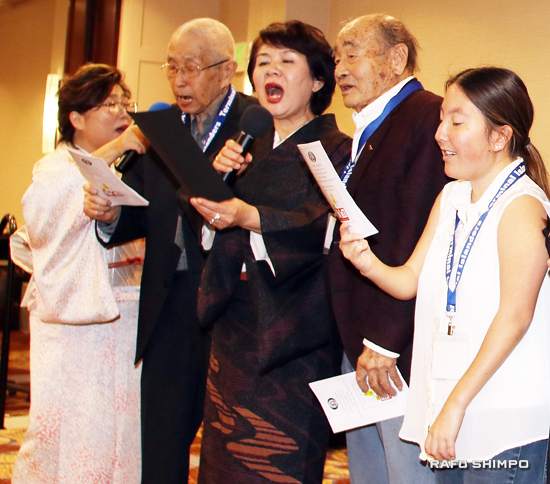 Attendees sang “Oshogatsu no Uta” (New Year’s Song). 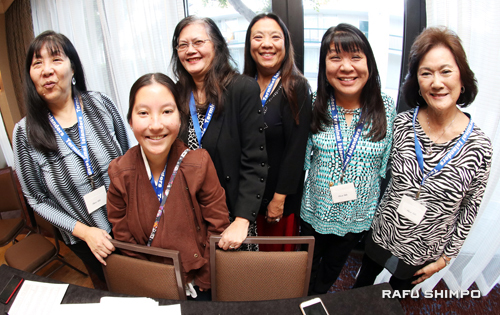 The new officers and board members are: Minoru Tonai, president; June Miyamoto Donovan, secretary; Diane Yamashita and May Nishiyama, treasurers; Charlie Ohei Hamasaki, Itsu Iwasaki, Takashi Kushi and Asako Miki, vice presidents; Donna Cottrell, Amanda Donovan, Barbara Iwasaki, Jillian Kwong, Kelsey Kwong, Rene LePage and Midori Sanchez, board members. Advisors: Terry Hara, Nori Hiromoto, Toshiro Izumi and Kisaye Sato. The next Terminal Islanders event will be the annual picnic in June.